The 'Athena' Custom Leather IWB Holster by Soteria Leather is known for deep handgun concealment. This versatile concealed carry holster can be worn as an appendix carry holster, with or without a belt, and clipped in your handbag to create a pistol purse. 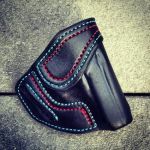 This custom holster can also be a boot holster. Even though the Athena concealed appendix carry holster can be worn by men and women, this handgun holster is very popular with women. Regardless of shape or size, women find the Athena makes it easy to carry a concealed weapon, with almost any style of clothing. 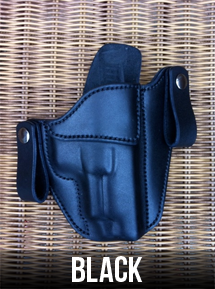 The Athena inside the waistband gun holster is constructed of leather from American cattle. 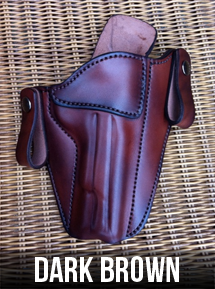 Appendix carry holster is to be worn on either side of the front zipper. 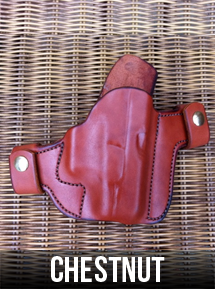 The Athena handgun holster can be used with a 1-1/2" belt. The Athena concealment holster can be worn as a boot holster. The concealed carry holster can also be clipped securely into your purse. This IWB conceal and carry holster is available for the following weapons AND MORE. Please check the options list. If you do not see what you are looking for, please email. "I LOVE IT!!! My new favorite holster. I've already recommended it to several friends." T.H.